Basic Electricity. Direct Current Instruments. Devices, Symbols, and Circuits. Three-Phase Motor Starters. Three Phase Motors. Direct Current Machines. Direct Current Motor Control. Development of Control Circuits. Maintenance Troubleshooting. 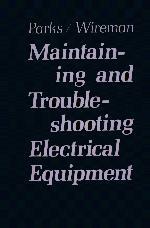 Electrical Troubleshooting Charts. Standard Elementary Diagram Symbols. Resistor Control Chart. American Wire Gauge. Index.